I’ve noticed that for almost all curvy women going shopping is not a very pleasant experience. But I completely understand why. I know how hard it is to find good quality clothes with a beautiful and modern design in a plus size. To make your searching process easier, I’d like to share with you a list of ethical and sustainable brands that have extended size range or specialise in plus size fashion. If you are looking for shoes, bags or accessories, please check our ethical brand guides for more recommendations. I hope you’ll find something beautiful for yourself! Effortless basic essentials you can mix, match, and wear all year round. $, US, Sizes: 10 - 28, Worldwide delivery. 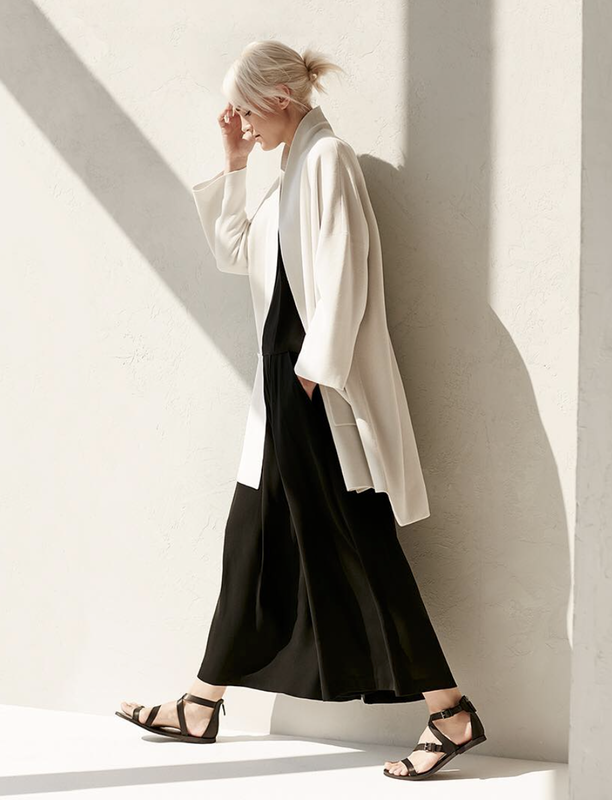 Great selection of professional wardrobe staples and elegant basics. $$, US, Sizes: 00 - 24, Worldwide delivery. Beautiful and delicate tops, dresses and pants with one size design. Beautiful elegant and casual clothes made out of silk and linen. $$$, US, Sizes: XS - 4XL, Worldwide delivery. $-$$, US, Sizes: 00 - 24, Worldwide delivery. Gwynnie Bee is a clothing rental subscription service for women with sizes ranging between 10-32. $, Available only in US, Sizes: 0 - 32. Chic casual style with modern and fresh design ideas. $$, US, Sizes: 0 - 28, Worldwide delivery. This italian brand is the perfect place to buy good quality clothes for the office. They always have a wide range of beautiful formal shirts and also some great fitting suits. $-$$, IT, Sizes: 0 - 24, EU delivery. Here you can find some beautiful and comfortable casual pieces for your wardrobe. They also specialise in knitwear, so check out their sweaters and cardigans too, I think they look very chic. $$, US, Sizes: 00 - 22, Worldwide delivery. One more italian fashion brand where you can find high quality and very well fitting clothes. I would say this brand will suit anyone who is looking for classic style and timeless design. $$, IT, Sizes: 46 - 62, EU delivery. $, US, Sizes: 0 - 20, Worldwide delivery. Sustainable essentials for business wardrobe. $, Germany, Sizes: 12 - 20, Worldwide delivery. One more amazing brand coming from the US. They’re also practicing a very interesting exchange program. If you buy a dress, but in some months you’ve changed your size, you can return it and get a new dress in your new size. Later, the dress you returned is being donated to charity for women in need. Interesting, practical and a very smart idea. $$, US, Sizes: 6 - 32, Worldwide delivery. Beautiful and feminine clothes that are easy to match and wear. The collections are usually quite versatile, so it won’t be hard to create an interchangeable capsule using only their clothes. $$, UK, Sizes: 18 - 28, UK&EU delivery. Famous american brand that also has the plus size line. All their clothes are made out of high-quality natural fabrics in a minimalistic and casual style. I would say it’s a great place to buy your wardrobe essentials. $$, US, Sizes: 0 - 24, Worldwide delivery. As you can see, plus fashion exists. Don’t be afraid to buy online. Most of these shops offer much better and easier ways for you to understand what size to choose. Moreover, you save yourself a stressful shopping trip, have more options to choose from and get a quiet fitting in the comfort of your own home. If you have any questions, do not hesitate to ask. It would also be great and super helpful if each one of you would share in the comments your favourite plus size brands and designers, so we can make this list even longer.